I haven’t added to The Library for several months and I’m overflowing with books, movies and music to mention. Today I want to talk about one of my favourite books. If you are a creative writer, you must own this book. 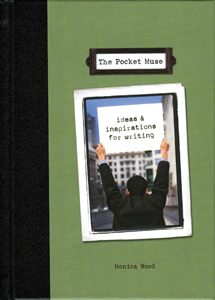 It’s called The Pocket Muse, written by Monica Wood and published by Writers Digest Books. I have read many books on writing but this one is the pick of the lot. It distills all the necessary wisdom into bite sized chunks, interspersed with writing prompts, gorgeous pictures and quotations. Wood covers an amazing variety of subjects, from prompts to get your writing started, through dealing with writer’s block, to finding an agent. Each new page is a delightful discovery, covered with hilarious and thought-provoking photographs, tasteful use of colour and intriguing designs. Just what Creativity needs to rejuvenate and start sparking again. Along with the encouragement and eye candy, there is your fair share of “marching orders” regarding procrastination, writing routine and other areas where writers need frequent prompting. But Wood always makes sure she ends with a positive. If you would like to read excerpts from this book, pop over to Monica Wood’s site. My only complaint is, because the book is full of random snippets, it’s difficult to find the point you want a second time. I’ve spent ages flicking through the book trying to locate a quote or prompt I want to read again, cursing the fact I hadn’t put a marker in it – but then I love everything in the book so everything would be marked and I’d still be stuck. The second volume The Pocket Muse Endless Inspiration is just as good. It contains more of everything that made the first book great, as well as extra information which completes the collection of writing wisdom. In the immortal words of Goldilocks, these books are ‘not too big, not too small. Just right.’ If you haven’t bought, borrowed or secretly absconded with one yet, get cracking. Categories: The Library | Tags: book review, Creativity's Workshop, Monica Wood, The Pocket Muse, writing, writing advice, Writing Tips | Permalink.